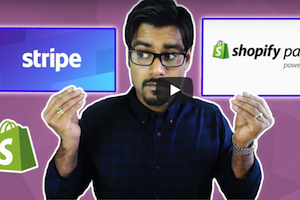 Today we dive a bit further into Stripe and Shopify payments. If you’re new to dropshipping, check out Bizathon3 and get up to speed. For many people just getting involved with Dropshipping, the idea of Payment Gateways can be confusing. We covered the basics of Payment Gateways For Shopify Stores here. Today, we are covering Stripe and Shopify Payments. Since most of our traffic is directed toward the United States, we set our currency to USD. Be sure to set your currency to whichever currency is used by your customers. However, if you’re from the UK, Shopify will default to Pounds or Euro. You won’t be able to edit this. Contact Shopify Support and tell them to manually change your currency as it’s not ideal for your business. If you live in the UK, but conduct your business in the US, you’ll can also use Stripe. Even though Shopify Payments is powered by Stripe, they don’t support all of the same countries. If that’s the case head on over to Stripe and create an account. Once your account is created, link it to your Shopify store via your store’s settings. Stripe is currently available in 25 countries. India will be added to that list in the very near future. What do you do when your country doesn’t support Shopify Payments or Stripe? The first thing we suggest is confirming whether or not PayPal is accepted in your country. If so, great, we’d definitely go that route. Otherwise, if PayPal isn’t available in your country, 2Checkout is probably your next best bet. That’ll do it for Episode 23 – Great work! P.P.S. Click here for Episode 24! I have been your youtube follower since long and have followed all your videos for facebook advertisement strategies in your English channel. I have a question, residing in India, If i am planning to sell in USA, is this suitable and satisfactory from customers’ point of view to have just paypal as the payment option? Since i dont want to go for 2checkoout, as i have heard lot bad about it. Also is it possible to have some other option like something else which charges on transaction basis instead of asking for a premium account initially since as a beginner i have less funds. You can start with just PayPal. Stripe should launch in India this year or the next.